The company releases details on its "brave new world" in a matter of days. Bungie wasn't quite ready to reveal its upcoming game Destiny as early as late last year, but a leak forced the PR department to spill some initial details. If that wasn't enough to sate your appetite for more information on Bungie's next project, you'll only have to wait a few more days for the company to finally talk about its Destiny. A blog post on Bungie's website announced an official reveal is coming soon for its upcoming title (and yes, it will actually be called Destiny). "In a matter of days, we're going to give you your first glimpse into the vision and ambition that's driving the creation of our brave new world," the post teases. 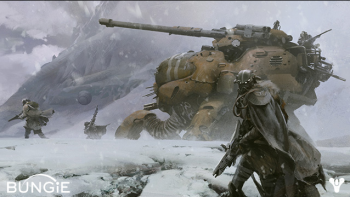 The Destiny Facebook page provides a more specific date, stating that the reveal will be "right here on Feb 17". Plenty of social media options are already up and running: Facebook users can add the aforementioned official page to their interests, Tweeters can follow the official Twitter feed, and Google+ users can check out the new Google+ page. Last year's leak uncovered some basic plot details, painting a story of a fallen human race scattered throughout the solar system. Players will possibly take control of a Knight in the Last City, defending the surviving members of humanity against hostile alien races. They'll be assisted by the Traveler: an alien vessel that presides over the planet. Time will tell if any of these details remain the same. In the meantime, you can try your hand at solving the alternate-reality browser game, or pore over the previously leaked screenshots one final time.